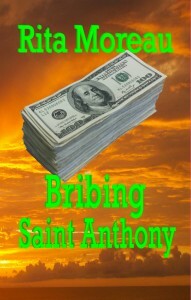 Bribing Saint Anthony is an entertaining and humorous mystery. A missing husband. A plot to blow up a national treasure. Fortune telling aunts. Mary Catherine, MC for short, didn’t move as the Queen of Boca Vista, Babbs La-Fleur, placed a pile of cash, which appeared out of a purse she knew cost more than her car, smack dab in the middle of her desk. Word at all the cocktail parties was that MC had a skill that came in handy for an aging socialite going through a divorce. She was good at finding cash in hidden bank accounts. Cash to pay for a nip and tuck and a new identity: Cougar. Hired that day by Queen Babbs to find her bad boy husband, Charlie, MC was back on familiar ground, tracking down bad guys through clues left in the DNA of their paper life. Asking her Aunt Sophia to read the family fortune telling cards might have helped. Instead, the paper trail Charlie left takes MC from a murder in the world of rich socialites to working with covert government agents deep in the world of counter terrorism.